In our last blog we introduced the GDPR related features that were introduced in Enterprise Vault 12.3. Veritas has in fact added a number of other new features and we wanted to showcase some of these. Enterprise Vault 12.3 now supports SMTP provisioning groups and this is now the recommended way to configure targets for SMTP Mailbox Journaling and SMTP Group Journaling (formerly known as Selective SMTP Journaling). 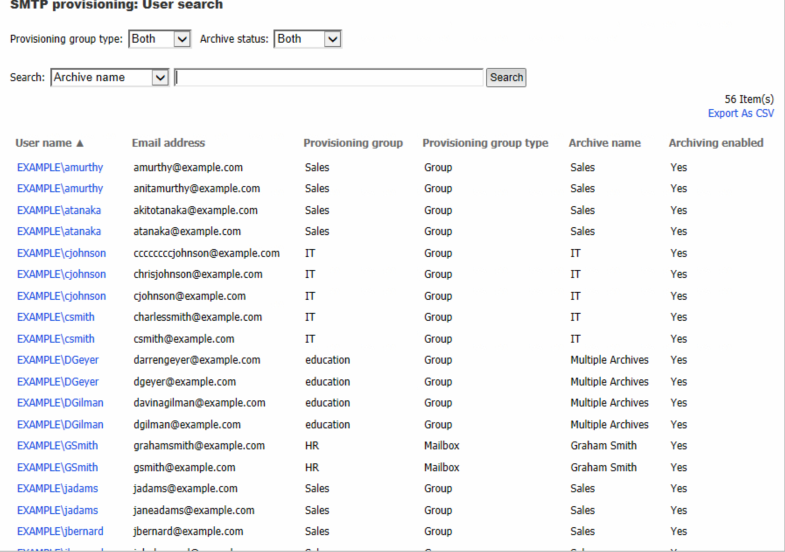 The advantage of this is that you can now select an an Active Directory user group, and then provision all the users in the group for SMTP archiving at the same time, which saves you from having to add each user as a target. You still have the ability to manually add a target if you wish. Note that if using Provisioning groups, the first provisioning group will set the ‘Selective Journal Archiving’ setting in Site Properties -> Advanced -> SMTP to inclusive, but if the administrator changes this setting it is not automatically updated. What is the difference between Selective Exclusive and Inclusive? In effect with Exclusive the message is stored in one archive only and with Inclusive the message can be stored in more than one archive. What is the advantage of archiving to multiple archives? You can now assign multiple archives to targets for SMTP Journaling and SMTP Group Journaling. Enterprise Vault automatically maintains the consistency of the retention settings across the archives assigned to a target address or group. If the archives for a target are spread across Enterprise Vault storage servers, Enterprise Vault also performs archiving load-balancing across the servers. In the Administration Console, you now add routing addresses under Targets > SMTP > Manual targets. You select the type of journaling when you add a manual target. Although you can also add manual targets for SMTP Mailbox and Group Journaling, it is recommended that you use provisioning groups to configure targets for these types of journaling. Existing targets that you added in the previous release of Enterprise Vault are listed under Manual targets. During the upgrade to Enterprise 12.3, the journaling type of existing targets is determined based on the archive type. SMTP Mailbox journaling is used to store all messages in an archive that is exclusive to the user. There are two ways to configure SMTP Mailbox Journaling. Manual Targets for SMTP Journaling, both Exchange and Internet Mail archives are supported using this configuration. You can view a summary of all your SMTP targets in the Administration Console which is really useful to understand where the messages are being stored. Improved performance when deleting items during storage expiry processing. Consistent implementation of storage expiry across NTFS and Centera partitions. In the Enterprise Vault Administration Console, these settings are in the properties for the Enterprise Vault storage server. In Computer properties, click the Advanced tab, and list the settings for Storage to view the new settings. Enterprise Vault 12.2 introduced a feature with which you can create one or more retention folders in your users’ Exchange mailbox archives. With Enterprise Vault 12.3, you can now create retention folders in Internet Mail archives as well. In addition, when defining the properties of retention folders, you can now supply alternative names for them in multiple languages. For example, suppose that some users in your organization employ English and others employ French. You can now supply one folder name to suit the English users and an alternative name to suit the French users. This feature overcomes a limitation in earlier versions of Enterprise Vault: the need to create multiple, language-specific retention plans in order to supply retention folder names in different languages. This is an important change in behaviour for new installations of Enterprise Vault 12.3, connections to Enterprise Vault web applications require HTTPS with Secure Sockets Layer (SSL) by default. Enterprise Vault web applications are configured in the Default Web Site in IIS. When configuring a new installation, the Enterprise Vault configuration wizard creates and installs a self-signed certificate, if no certificate exists. The configuration wizard adds to the Default Web Site an HTTPS binding on port 443, if required, and enables SSL on all Enterprise Vault virtual directories. It is strongly recommended that you replace the self-signed certificate as soon as possible with a certificate obtained from a trusted authority. If you are upgrading from an earlier version of Enterprise Vault, the existing configuration of Enterprise Vault web applications in IIS remains unchanged. To ensure the security of these web applications, it is recommended that you manually configure HTTPS with SSL on all of the Enterprise Vault virtual directories. Improvements have also been made to the auditing of roles-based administration, vault store and partition administration, and advanced settings. File types for OCR conversion of embedded images. This setting lets you limit OCR conversion to selected file types. OCR conversion of scanned pages. This setting lets you control whether to apply OCR conversion to scanned pages in PDF documents. Enterprise Vault now supports the migration of archived data to Amazon Web Services (AWS) Commercial Cloud Services (C2S) storage using the AWS C2S storage migrator. The AWS C2S migrator plug-in is installed as part of the Enterprise Vault 12.3 installation. • Enterprise Vault classification using Microsoft File Classification Infrastructure is not supported on Windows Server 2016. Essentially you have a targeted and useful set of features and enhancements in 12.3. Please contact us if you would like a demo. As experts with Enterprise Vault we can work with you to upgrade your environment quickly and with the minimum impact on your production environment.